Here's a great post I found on 365 Things to do in Silicon Valley - Sounds like fun so I thought I'd pass along this link to the blog. In getting reacquainted with outdoor exercise once again this year, my husband and I have been to St. Joseph’s Hill Open Space Preserve twice in the last couple weeks...read the rest on the original site. Just in time for that comfort food attack that hits you about this time of year, Boston Market is highlighting the healthier eating options now available at the popular chain's 490 locations. 88 percent of the strawberries grown in the United States come from California, and 50 percent from right here in the Silicon Valley area: Watsonville, Salinas, Santa Cruz. So it's only fitting that the competition to showcase sweet ways to use strawberries in Valentine's Day recipes should originate with the Watsonville-based California Strawberry Commission. The prizes in the recipe contest for "Most Romantic Valentines Day Dish" (aside from bragging rights about how romantic you can cook) are: Amazon gift cards: First Place - $500, Second place - $350, Third Place - $150. 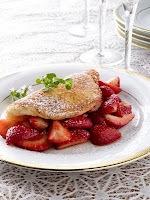 Winning recipes will be featured on the California Strawberries website for all to enjoy. Submit recipe online at the California Strawberries Recipe Submission Page by Friday, February 4th, 2011. Upload the recipe photo at: California Strawberries Facebook Page (www.facebook.com/castrawberries). Be sure to include recipe name and the words "Most Romantic Recipe Contest." Eligibility – Must be a U.S. citizen, 18 years and older. Prizes – $500, $350, $150 Amazon Gift Cards will be awarded for 1st, 2nd and 3rd. Who can enter? – Anyone who enjoys cooking and food bloggers of all levels are invited to participate. Criteria –The dish must include fresh or frozen strawberries. It could be for any meal of the day and be categorized by main course, salad, side dish, appetizer or dessert. Additionally, it should have a romantic quality. Visual appeal, taste, creativity and ease of preparation will also be considered in the judging. Judging – Winning recipes will be selected by the California Strawberry Commission staff. Particular consideration will be given to recipes submitted with clear and creative photos. Further attention will be given to recipe photos that receive the most comments or "likes" on the California Strawberries Facebook page. Contestants are welcome to invite friends to "vote" for their photos. 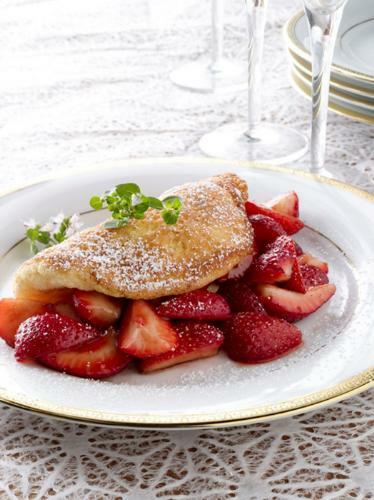 For a little sweet inspiration, visit California Strawberries' recipe pages for romantic and alluring recipes such as Souffle Omelet with Balsamic Strawberries or Chocolate Dipped Strawberries! My email box this morning had a note telling me about a chance to win a vacation at the Lapa Rios Ecolodge in Costa Rica...hikes, surf, yoga and more. Ok, it's winter and frankly, a week any place where there are beaches, sand and trees sounds pretty great. a spectacular vacation at the beautiful Lapa Rios Ecolodge in Costa Rica. Set in 1000 private acres of rainforest, Lapa Rios overlooks the gorgeous wild Pacific Ocean. Staff naturalists will guide you on hikes in the rainforest; you can hang 10 in the surf, kayak into the sunset or marine watch via ocean mangrove boats. Need more? You can also do yoga, massage, or just indulge yourself in a hammock overlooking the heavenly beaches. Ok, I didn't see this one coming. Tim Gunn teaming with Weight Watchers? We've come to love his tidy, proper, tasteful input on Project Runway, but giving advice via Weight Watchers....well, we'll have to see how the organization uses him. His quote toward the end, "If getting fashion right were easy, everyone would look fabulous, but it can be challenging." is a little more in keeping with the Tim Gunn voice I'm used to hearing on TV. Follow three fashion fundamentals: silhouette, proportion and fit. When they are in harmony and balance, anyone can look fabulous. Invest in the essentials: wrap dresses, belts and skirt/top combinations. Each of these items can be introduced into the wardrobe at any point during weight loss and will have long lasting staying power as you continue to lose weight. Shop smartly: when people shop on a budget they are very thoughtful and mindful about how new items will fit into their wardrobe and lifestyle and how they will transition throughout the weight loss journey. Think strategically about your overall wardrobe and how the garments you are purchasing will fit in. Embrace your shape: even if it seems that everyone is wearing a particular style one season, be sure to evaluate how it will work with your shape before committing to purchase it yourself. Embrace your own shape—it's beautiful -- and adopt the trends that accentuate your best features. "I am so proud to be working with Weight Watchers on this extraordinary project and was so inspired by the stories of wonderful success. Nothing makes me happier than providing guidance and tips to help people look great as they lose weight and get healthier," said Tim Gunn. "If getting fashion right were easy, everyone would look fabulous, but it can be challenging. The combination of the PointsPlus program and providing helpful styling tips is great because it helps people celebrate their new look and recalibrate their thinking about style, while finding an enhanced self-confidence." Visit WeightWatchers.com to view Tim Gunn's style tips for the weight loss journey and to check out Tim's work in the new advertising campaign. Americans are ringing in the New Year with new intentions, according to the latest American Express Spending & Saving Tracker. More than half of adults are planning to spend more (14 percent) or the same (40 percent) in 2011 than they did last year, with the majority of that spending focused on themselves. Personal savings rates are still well above pre-recession levels and consumers will remain focused on saving, but they will set aside less than they did in 2010. After setting aggressive savings goals for 2010 -- $14,000 on average -- consumers are paring back their savings target this year to a more modest $2,600. The latest American Express Spending & Saving Tracker1 explores consumers’ views about their spending intentions and financial goals for the New Year. The research sample of 2,025 adults included the general U.S. population, as well as two subgroups - the affluent2 and young professionals3. In terms of where consumers will spend in 2011, maintaining their appearance is king. Top categories include grooming (73 percent), health/fitness (70 percent) and clothing for themselves (61 percent). Categories at the bottom of the list include video game systems and games (34 percent), jewelry (34 percent), portable media players (32 percent), and tablet computers (i.e. the i-Pad) or e-book readers (30 percent). Similar to 2010, consumers cited “exercising more” and “losing weight” as their top three and four New Year resolutions, respectively, behind saving money and spending more time with friends and family. However, more than one in four (28 percent) consumers who are starting the year with a savings strategy would sacrifice a portion of their savings to achieve their goal weight.